A bear's forest takeout may include ants, trout, plants and a berry, but often the most convenient option for a hungry bruin is garbage, bird seed and pet food. Colorado's black bears are beginning to emerge from hibernation and though in many areas of the state spring has produced plenty of natural forage, a bear can be tempted to go after unnatural food sources as well. The best advice for homeowners and campers who live and recreate in bear country is to remove or pack-up tightly anything that might attract a bear, said Mike McLain, the Division of Wildlife's area wildlife manager in Montrose. "People need to be cautious with garbage, dog food and charcoal grills because bears have a tremendous sense of smell," he said. Black bears will eat almost anything and a bear that becomes conditioned to raiding human food sources can lose its natural aversion to people and become a nuisance or threat. Campers and homeowners who leave their food exposed are actually baiting hungry bears. "Once a bear is accustomed to finding an easy food source, it'll keep coming back for more," McLain said. Private landowners can avoid bear encounters or damage done to their properties by keeping their trash covered and in a "bear proof' container. Bears are already making an appearance in some of Vail's neighborhoods, and according to District Wildlife Manager Bill Andree, "many of the animals are up to their old bad habits." Two sows and their cubs were recently spotted rummaging through garbage cans left outside several homes in Vail. "Sows will teach their cubs where to fmd an easy food source," Andree said. "And trash cans left out often have veggies that the bears will go after." Although there is a Town of Vail ordinance that prohibits residents from leaving their trash containers outside, except on the day of collection, "we have people that put their trash out early anyway," Andree said. Steamboat's wildlife managers also have problems with bears raiding trash cans and according to Libbie Miller, district wildlife manager in south Steamboat, it's not a bear problem, it's people problem. "Problem bears cannot be rehabilitated," Miller said. "Leaving trash or any bear attractants outside will change the bear's natural behavior. And it also puts them in close proximity to people," she said. One particular sow that Miller has been monitoring for several years recently emerged from hibernation with two cubs. "Already the sow and her cubs have been spotted in town and this particular bear we've had problems with in the past," she said. Bears not only have an outstanding sense of smell, they also have a great memory for where to find an easy food source such as garbage, Miller said. Bird feeders are also the perfect bear attractant. Hungry bruins sense the sweet smell of a hummingbird feeder and are drawn to that particular house or cabin. "Bring in those bird feeders at night," said McLain, who often informs new homeowners in the Montrose area about bears. "If you do not have a bird feeder or simply take it inside at night, the bear is not as likely to come and tear it down," he said. Bear encounters are rare, but most frequently occur when people leave food of any type outside and exposed. 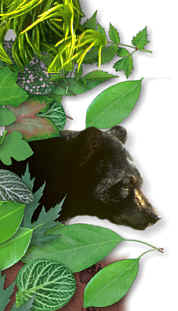 Whether the spring moisture continues into summer will determine how Colorado's black bears behave this summer and fall. Bears do not eat while in hibernation, which is generally from October or November to April or early May. Once they emerge from their dens, a bear will live off its stored fat built up prior to denning until their digestive system becomes active. They then begin to eat the fresh green grass produced by a wet spring. If Colorado has a dry summer and there is not an ample supply of natural forage, a bear might be inclined to travel long distances to find an easy food source such as trash cans in a residential area or a barbecue grill in a campground. Although black bears are generally shy and avoid human contact, there are a few precautions campers can take to avoid encounters. Keeping camps clean, storing food properly, disposing of garbage in bear proof containers and sleeping far away from food areas can help campers avoid having a bear raid their camp. Anglers who fish in Colorado's high county lakes and streams should also be careful not to leave fish entrails behind after cleaning their fish. Entrails and any other bear attractants should be disposed of in proper trash containers. To help prevent outdoor enthusiasts from encountering bears, the Forest Service has posted the Division's bear warning signs and installed bear proof trash containers in many of the national forests around the state. Division and Forest Service personnel also hand out helpful brochures about living in bear country. These brochures include tips on how to avoid bear encounters and are also available to the public in Spanish. Rob Firth, the Division's area wildlife manager in Hot Sulphur Springs, said this year in his area there is ample green grass available for bears. "But if they smell food, especially yearlings, they'll go after anything they can find." • Make your property safe by keeping garbage out of reach and smell of bears. Use bear proof trash containers. Contact the Division of Wildlife for designs. • If you have pets, do not store their food or feed them outside. • Clean your BBQ grill of grease and store inside. • Hang birdseed, suet and hummingbird feeders on a wire between trees instead of on your deck or porch. Bring all bird feeders in at night. • Do not put fruit, melon rinds and other tasty items in mulch or compost piles. • Most bears sighted in residential areas within bear habitat do not cause any damage. If a bear doesn't find abundant food, it will move on.